The Jr is our smaller size monofin and fits all children’s shoe sizes and even some women’s shoe sizes. The Pro is our larger size monofin that fits in our mermaid Size Youth 12, and all Adult size mermaid tails. This will fit all adult shoe sizes for both men and women. ALL foot sizes might need to exert some effort to get your feet through the holes at first, but keep trying, there is plenty of room inside. The ankle cuffs are made to fit snugly so your monofin stays put while you swim, but your foot comes out easily when you want it to with just a slight tug and kick! DO YOU RECOMMEND A MONOFIN FOR EVERYONE? First of all, we do not recommend a monofin for any child under 6 years old, and do not make a monofin in a toddler size. They need their little legs and feet free as they learn how to swim. Toddler tails don't go past the feet, but these little mermaids still feel like the real thing! 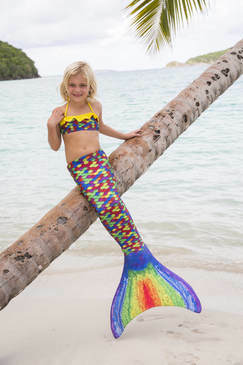 For children age 6 and up (and adults), they must be a competent, experienced swimmer that meets the criteria we have outlined in our “Mermaid Ready” video and the safety materials that come with every tail. Whenever anyone is trying a monofin for the first time, they should stay in shallow water until they are comfortable standing, floating and swimming in it! Also make sure to learn the Quick Release Method of removing the monofin before swimming in deeper water. So, should you choose a monofin for your child? It really depends on your child’s swimming experience and ability, not their age. Once they meet our Mermaid Ready criteria, they should first learn to swim with a dolphin kick without anything on their legs or feet, then experience it with just the monofin, and then finally wear the tail with the monofin inserted. This can be learned very quickly and then they will be ready to have a great time, wowing everybody at the pool. Adult supervision is always required for water safety. An adult needs to supervise carefully, making sure a child starts out in the shallow end of the pool. Start slow until you feel they are ready. Click here to read our full safety precautions and recommendations.